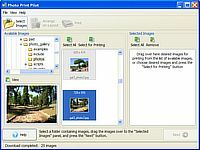 Photo Print Pilot is photo printing software specially designed for photograph printing at home. The program allows you to take images for printing from different folders. To print photos in a desired format you should just choose a template with a size of the images for printing and a way they will be arranged on a page. The program automatically resizes the images and arranges them on a page according to the selected template. Photo Print Pilot supports the following graphic formats: BMP, GIF, JPEG, PNG, TIFF.